Illinois holds hundereds of miles of exposed rock. From the Limestone of the Mississippi and Ohio river valley's to the Sandstone of the Shawnee Hills, this midwestern state offers a lifetime of stone to enjoy. Hidden Treasure - Killer Route!! The premier sport and traditional destination in the state is Jackson Falls. With over 400 routes, Jackson Falls has something to offer to every level climber. Jackson is truly the sport climbing capital of Illinois. Jason Kehl on Atlas V5 at the Holy Boulders. Photo by Abbey Smith. Every boulderer who passes through the state should make a point to stop at the Holy Boulders. The Holy's contain over 300 boulder problems and a few great Trad lines. With arguably the best quality Sandstone in the state, and possibly the midwest, the Holy's are the classic proving ground for anyone desiring to take themselve to the next level. Thanks to the courageous work of Lief Faber, the Illinois Climbers Association was able to work side by side with the Access Fund to buy the Holy Boulders property, thus securing it in climber friendly hands forever! But DO NOT FORGET, although the Holy's are protected, they have come at a cost. The Illinois Climbers Association has been hard at work raising funds to repay the Holy's debt back to the Access Fund, but we need your help. To contribute, please donate to the cause by following this link: paypal.com/donate/?token=oD… or contact the Illinois Climbers Association to find out other ways to help. Makanda Bluff, Southern, Illinios, photo: Bob Horan Collection. 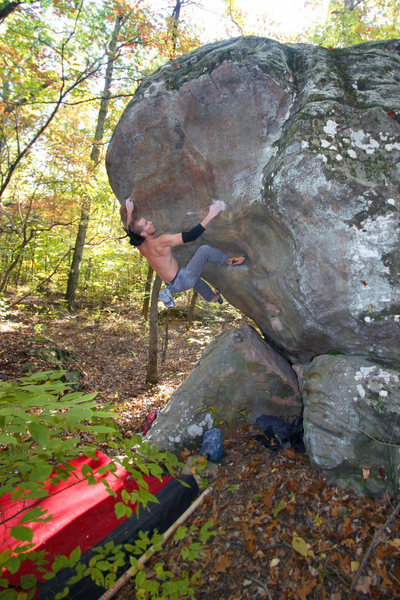 Giant City State Park is a great sport climbing and bouldering destination. 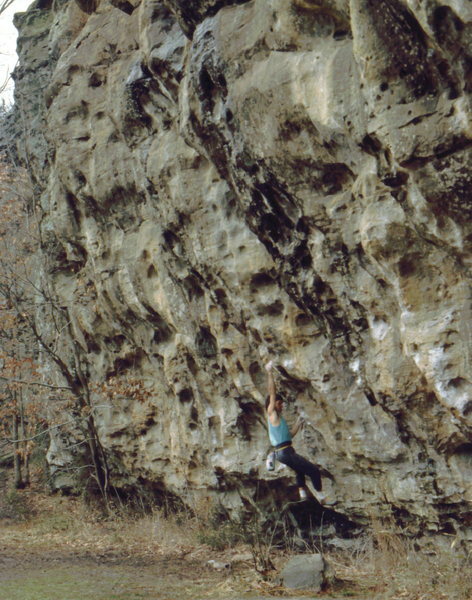 This historical testing ground is the birthplace of hard roped climbing in Illinois. Giant City contains some of the greatest top-roping routes in Illinois including City Limits, which at its time was one of the first 5.12's in the country. The park also offers many quality/leadable traditional lines and few classic boulder problems. Becky leads pitch 1 of Dizzy. If you are interested in multi-pitch climbing check out Cedar Bluff. 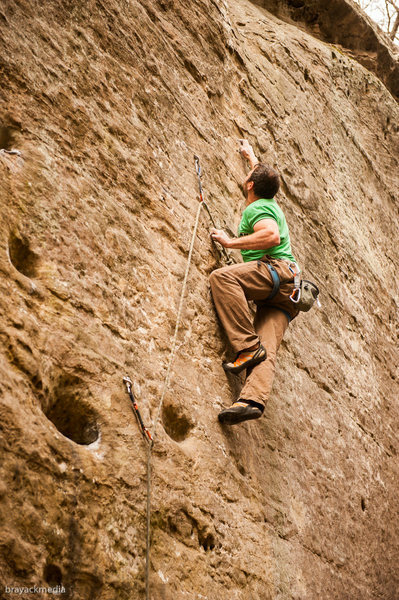 With many sport routes and a few quality multi-pitch routes that reach over 95 feet, Cedar Bluff is a great destination for anyone seeking to get high. Also important to note is its sandstone quality and height is very similar to that of the Red River Gorge. Although slightly pebbly, this bullet hard stone allows for great gear placements. 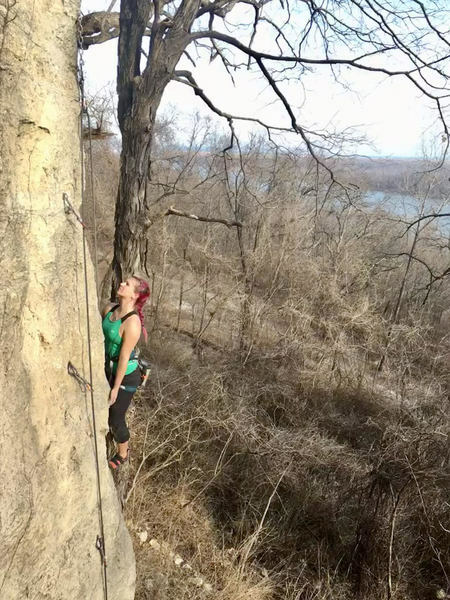 If you find yourself in the area, and not to be forgotten, Ferne Clyffe State Park offers great bouldering and top-roping opportunities as well. Both Cedar Bluff and Ferne Clyffe were well fought for by the Illinois Climbers Association, and with visiting climbers support, should continue to be protected and provide great climbing experiences. The above listed areas in Southern Illinois are just a few of what the state has to offer. There is no gaurantee that climbing will be protected. Please do your part to follow Leave No Trace ethics and abide by local regulations to hopefully prevent provoking any local land manager from restricting climbing access. The Illinois Climbers Association is proud to present Illinois' newest rock climbing destination, Pere Marquette State Park. 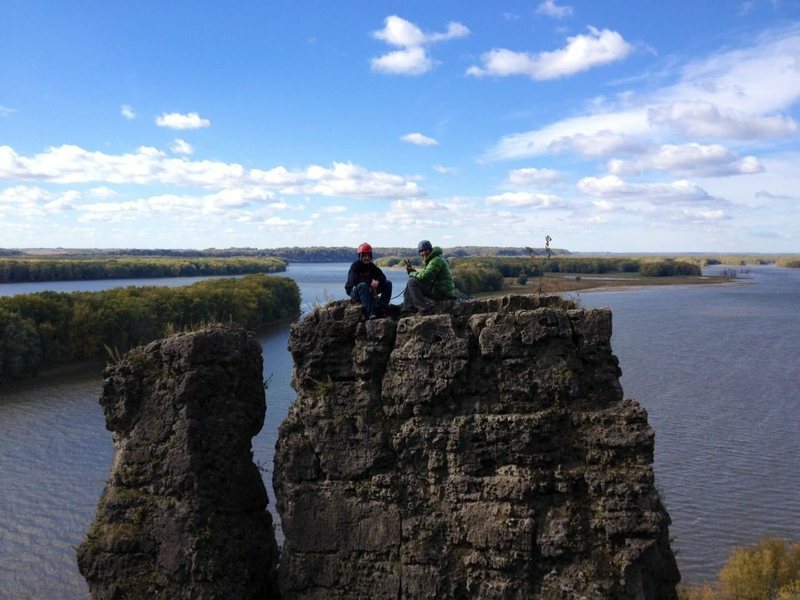 Located an hour from St. Louis just outside the lively town of Grafton, Pere Marquette offers highly featured limestone formations great for climbing. Since early 2015 the ICA has been working with the Illinois Department of Natural Resources to gain their blessing for this project, which includes new trails, landscaping with natural rock steps, and both sport routes and top-anchors for traditional leads. This new climbing area will ultimately have over 60 climbing routes. The Palisades is a great area for anyone living near Chicago who can get away for a weekend. It is located on the Illinois side of the Mississippi river, just across from Iowa. The limestone bluffs rise roughly 180 feet above the river level in some places, though none of the climbs are actually this long. Pretty much everything here is top-rope, with tons of natural anchor options in the trees and some boulders on top of the walls. This limestone can get pretty manky - especially with wet and even just humid weather. There are a few routes that are in bee territory here, which can make the climbing very exciting. Because of the humid and buggy summers, the best time to climb here is October to November. A nice dry crisp fall morning here is ideal. The Snake in a really 'fat' year. 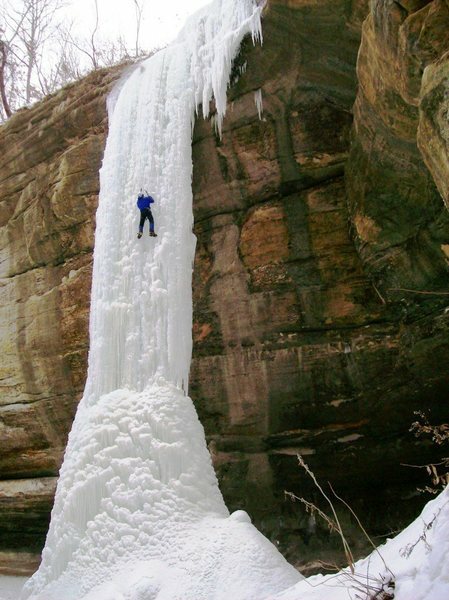 The canyons open to ice climbing have varied over the years: be sure to check at the Park office before you hop on the ice. Illinois literally has climbing all over, if you find yourself passing through and decide to stop you will not be disappointed. Click HERE to donate towards the Illinois Climber Association's cause. The ICA has been instrumental in conserving access to climbing all over Illinois. If you have any questions, comments or concerns feel free to contact them. Click on individual areas to obtain specific directions. 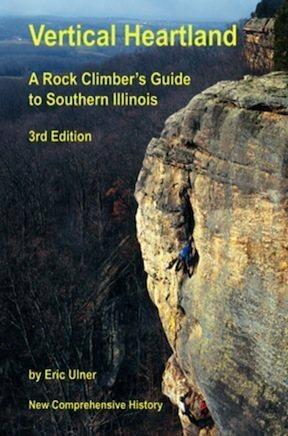 In Illinois there are two guide books for the southern portion of the state. The first is Eric Ulner's book Vertical Heartland. 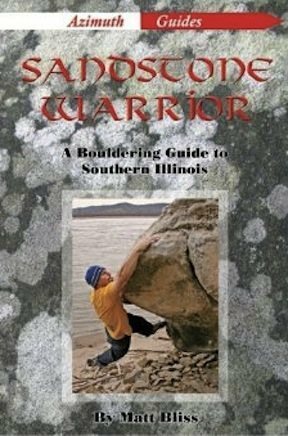 The other guide for Southern Illinois is Matt Bliss's book Sandstone Warrior. They removed access stairs and forbid climbing because drunk kids with coolers of beer, in the park at night illegally, have trashed it up and fallen down or off the cliffs too. THAT in their mind was related to the use of cliffs for anything vertical. Senseless. But climbing had not yet become a widely known indoor sport back then; no X Games, no MTV or action sports media, so nothing for them to relate to except guys who fall off cliffs with coolers full of beer. We wrote letters, made calls, had a meeting, explained our simple use, clean climbing, no pitons, toprope mostly, etc..and they still said NO. This was long before the Access Fund got started to the degree it is today. Chalk was not an issue, as it was the same substance and color as the dusty calcium carbonate limestone rocks. Fishermen leave bait containers and trash, and hike down the same rugged cliff trail that we do,but they get to stay. (they pay for stuff, we didn't; so go figure) Trespass and you would get your gear taken away plus a fine. If you visit Rock Creek you can see the remnants of past climbing...fixed pins on a lot of the walls. Rumor has it that Mike McCarrin had authored a hand drawn guidebook... I have also heard of some harder routes being established in the creek (.13ish) by McCarrin??? I'm looking to compile some sweet photos of IL or any midwest climbing for a writing project. Please send in a jpg low resolution format. In my opinion, the best multi-pitch route in the state is Tempura Tour at Giant City. Last year some friends and I spent a lot of time scrubbing and digging out cracks to open up three more pitches to make the route climb from the Makanda Layback to Georges. The route is well protected, has been throughly cleaned, and is very adventurous.